Imagine, if you will, a sportsman’s world without Ford Super Duty trucks. Since they account for more than half of the big, bad truck category, there would be an equally big hole in the market. That is not going to happen, of course. 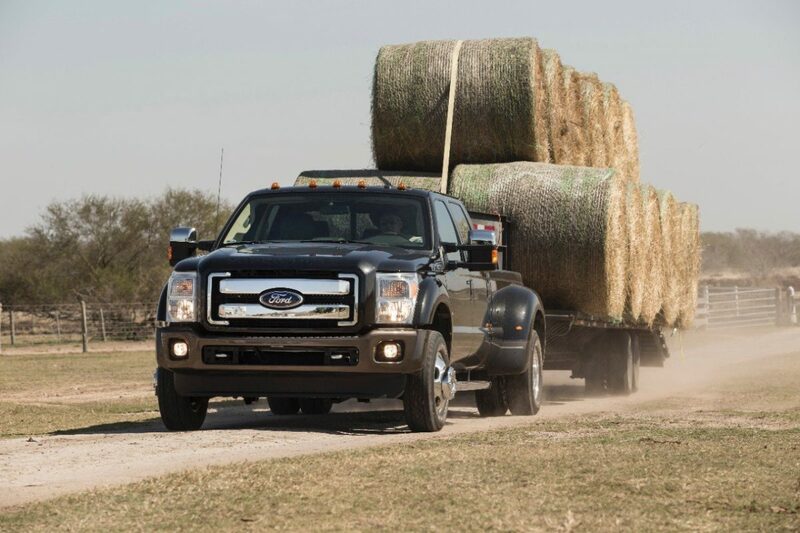 Ford is completely committed to Super Duty as part of its F-Series portfolio, and hunters and fishermen — particularly those who tow large trailers — are equally committed. I would have loved to show these workhorses towing boats or RVs, but — at this time — the only photos available are without a trailer or towing hay. Look for more images in the months to come. The truck leader gave auto journalists the hard facts that were missing when they introduced the 2015 model at the State Fair of Texas. We anticipated the wait and you should read nothing into it. When the first build of a vehicle is shown, there is generally a lengthy period of testing for fuel efficiency and towing numbers. With heavy duty trucks, there is less need for fuel efficiency numbers since the government doesn’t require them, but tow numbers, final horsepower, and torque figures do have a major impact on consumer buying decisions. 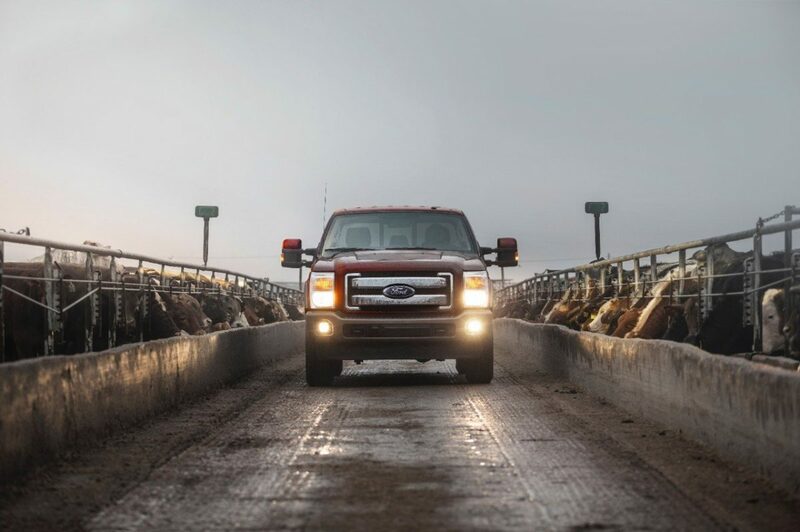 No one will be disappointed with the stats on the new Super Duty F-Series for 2015. 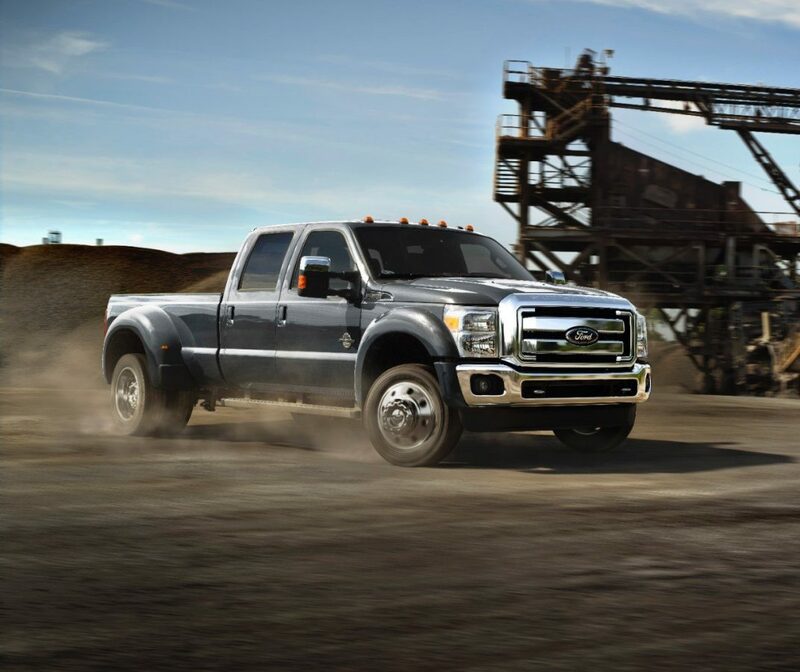 The second generation 6.7L Power Stroke V8 turbo diesel provides 440 horsepower (an increase of 400hp) and 860 lb.-ft. of torque, a class-leading number available across the line from F-250 to F-450. The F-450 chassis upgrades increase max gooseneck trailer towing capacity to another class-busting set of numbers –31,200 lbs. — with fifth wheel tow capacity raised to 26,500 lbs., and gross combined vehicle weight rating (gcwr) to a whopping 40,000 lbs. That’s a whole lot of trailer or RV. At the same time, the F-350 has increased fifth-wheel/gooseneck tow capacity at 26,500 lbs. and raises the gross combined weight rating to 35,000 lbs. “Our chassis people have worked in unison with our powertrain people to develop more than a great truck — it’s a machine engineered for work,” he said. I would have added a serious machine for serious outdoorspeople. Robert Fascetti, Ford’s vp for powertrain engineering explained that they are essentially giving Super Duty customers an engine designed for the larger F-650 and F-750 trucks. Key innivations are the compact graphite iron engine block and reverse-flow layout which places the exhaust inside the engine’s v-shape to help isolate the engine’s hottest temperatures to improve performance and efficiency while reducing NVH (noise/vibration/harshness). Translate that to improved driver comfort and better vehicle performance. The shorter airflow from exhaust to the new larger turbocharger improves turbo responsiveness which is key to providing torque quickly for the truck/trailer customers when they need it most. With a high-capacity towing package that includes new front springs and a wide track axle, the new F-350 has about 3,000 lbs. more tow weight when specified with the 6.7L Power Stroke engine. The F-450 has improvements that include 19.5-inch wheels and tires (commercial grade), upgraded rear U-joints and suspension components including new rear leaf springs, front and rear stabilizer bars and shocks. The steering system has stronger gears and linkage. Brakes are larger and have an optimized antilock brake calibrations for better braking performance. These Super Duty Trucks — especially the F-350 and F-450 — are not for every sportsman or sportswoman, but they do offer a great tow improvement. The F-250 is a favorite with many hunters and fishermen who tow larger boats or RVs. I don’t have prices, but, if you have priced or purchased these heavy duty performers before, I don’t expect you will experience sticker shock. As with all truck purchases, I encourage you to estimate your actual needs and not buy a truck that has more than you need.